Hi Jennifer, your RAV4 is all clean and ready for pickup. Are you interested in a premium wax today for only $4.85? Great! We'll get right on that, just give us 15 minutes. Your total today will be $39.50. Visually build multi-platform messaging & voice bots to engage anyone, anywhere. At the core of TextIt lies our exclusive Flow engine. With Flows, anybody can create engaging SMS and voice applications without the need of a programmer or expensive consulting company. Get a new phone number your customers can text or call to in minutes and build your app today, no code required! Each interaction in TextIt is defined by a step. By drawing arrows from one step to another, you define how users of your application will move through the flow. It's easy to create logic in flows to route users based on their responses. 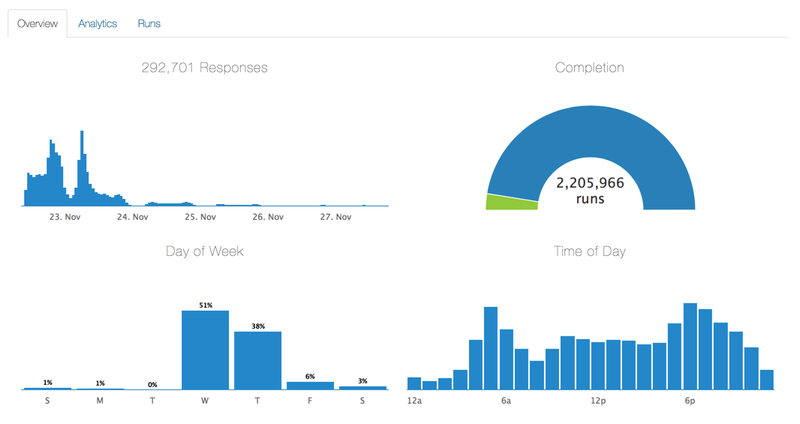 See results for your flow in real time. At any point in the flow, you can trigger actions, such as sending an SMS, email or even calling an external API. 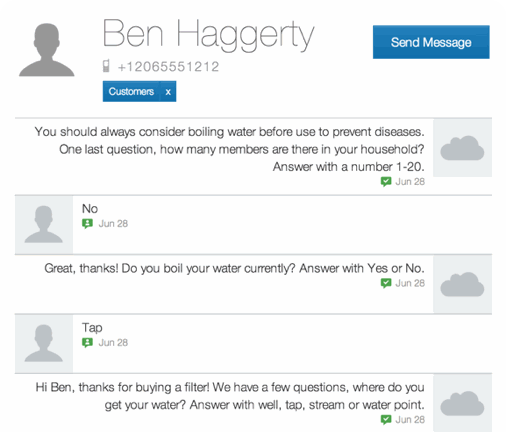 TextIt allows you to customize messages using information you've collected from the user allowing for personalized messages and increased response rates. Flows are powerful, but TextIt presents them in a way that makes them easy to understand. Watch our overview video to see how easy it is to deploy your own custom SMS application with TextIt. Every interaction with a flow creates a datapoint that is automatically associated with each user. TextIt lets you easily get that data into Excel for further analysis, or you can use our powerful real-time analytics to let you compare datasets across populations. Campaigns allow you to build your own SMS reminder system or even a drip marketing program. Choose what messages to send and on what schedule to keep your users engaged. You can even send your users through a flow at any point during your campaign. You need to know when your audience is trying to reach you. That's why TextIt highlights unexpected messages, helping you identify users who have questions or problems, making it easy for you to address their concerns. Send and receive SMS messages and organize them using labels, just like email. TextIt allows you to easily broadcast an SMS to a group of users, even allowing you to customize the message just like a mail merge. You can send broadcasts immediately or at a later time even repeating them on a set schedule if you like. Send it tomorrow or set a monthly reminder. Keep track of every user who has interacted with TextIt using Contacts. 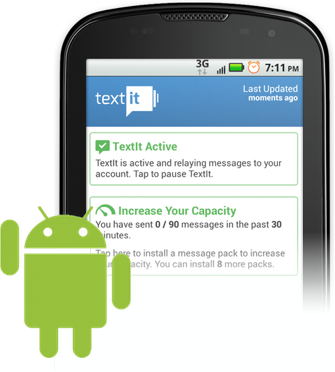 TextIt automatically creates a Contact for each user and saves their full message history. 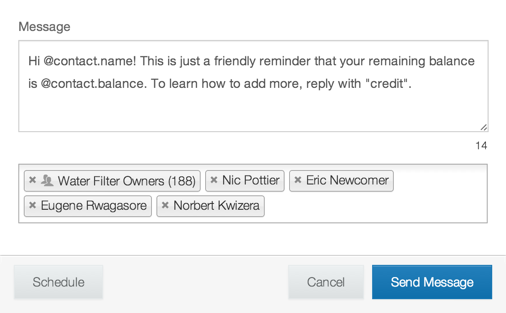 You can group contacts however you like and add custom fields that are appropriate for your organization. See your messages and their responses inline. TextIt already works anywhere in the world, instantly. Simply download our free Android application to create an instant, reliable and inexpensive connection to TextIt. Messages will then be sent and received using that phone's local SIM card automatically. If you are in the US, Canada or the UK, you can easily connect your Twilio account to take advantage of instant low cost messaging in your country. Read our deployment guide to see how to use TextIt in your country. TextIt also provides an exhaustive API so you can integrate it with your existing website.